Source: Produced in Sf9 insect cells. 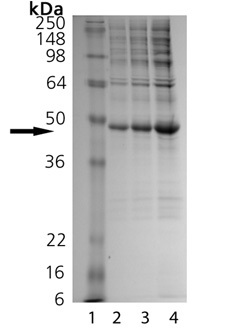 Recombinant full length MKP-3. Produced in a baculovirus expression system. Scientific Background: MKP-3 is a member of a group of dual specificity phosphatases which negatively regulate MAP kinases, dephosphorylating both the phosphotyrosine and phosphothreonine in the pTXpY activation loop motif. Transcriptional suppression of MKP-3 expression has been implicated in the development of pancreatic cancer. MKP-3 is located in the nucleus where it may act to anchor Erk 1/2. SDS-PAGE Analysis. Lane 1: MW Marker, Lane 2: 1 µg, Lane 3: 2 µg, Lane 4: 5 µg MKP-3.